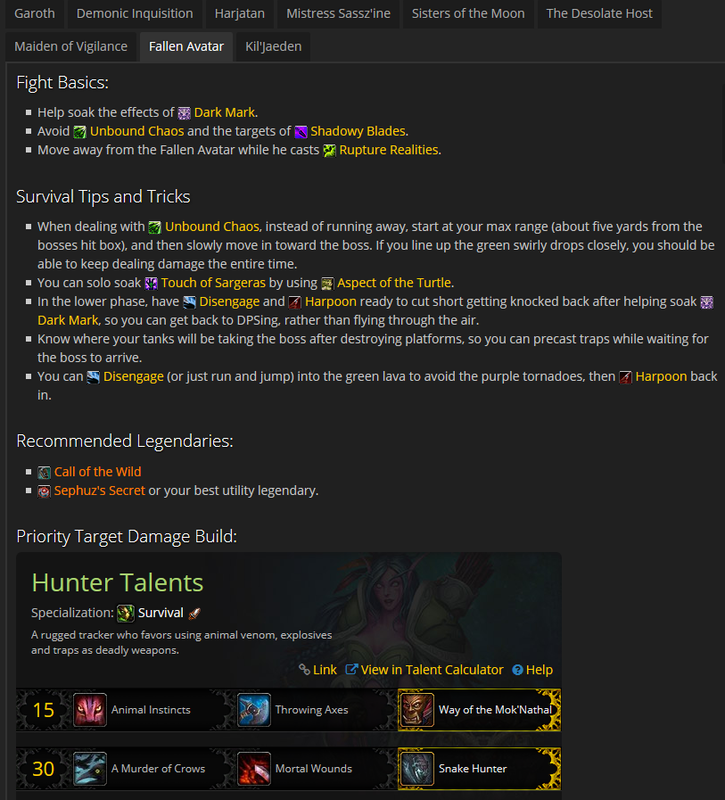 Mostly just to have a convenient place to store all the information, I created a "guide" over at wowhead for all of the Tomb of Sargeras builds information from the previous post here. You can find the Survival version here, or the Marksmanship version here. And a list of all the hunter gear that drops from that boss. Below I included some notes on the various builds and legendaries and such. But it's mostly just what was in the post here earlier this week. 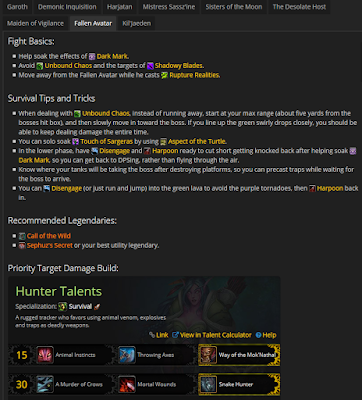 As we work our way through Mythics starting this week, and just as more people have ideas for fun ways to handle and/or cheese mechanics as a hunter, I'll try to keep updating these guides. I don't plan on doing one for BM, as I haven't played the spec in any raids yet this xpac. On a mostly unrelated note, we moved (for the time being, we'll see how it goes) the time for the Hunting Party Podcast to Mondays at 9pm Central US time. There's a pretty steady stream of WoW Podcasts on Monday nights, so you could, perceivably, spend the whole evening immersed in WoW while you try desperately to find a group to do your M+15 key at the last minute. I remain the only person on the podcast who isn't exclusively playing BM, which means we talk waaay to much about BM. I even spent a bit of time last night banging away on the training dummies as BM, just so I could get more of a feel for what they were talking about (also so I could have the spec ready for some light soloing). It's still a fairly boring spec to play, for my tastes, but it is nice to be able to revisit my spirit beasts, which haven't really seen any play-time this expansion. Still, we've gotta find another person who plays either MM or SV to join the podcast. This is getting ridiculous. I had some leads, but unfortunately, the new time slot likely will rule out any EU folks (you know, unless we find someone who's up for podcasting between 3-5am). Thanks for this guide, very helpful.